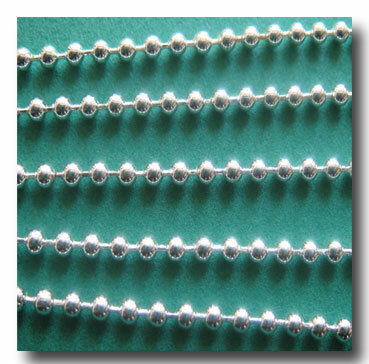 SILVER PLATE BALL CHAIN 1.8mm. FINISH: Silver plate. BASE: Brass base. STYLE: Ball Chain. WEIGHT: Light/Medium. DIMENSIONS: 1.8mm. Use with: 1-255 Nickel Plated Ball Chain Connector - 1.8mm. All CHAIN is sold by the FOOT. In the QUANTITY BOX, please enter the amount of feet you wish to purchase. Also Available in Gold Plate 1-271, Gunmetal 1-312, Black 1-277 and Nickel Plate 1-254. 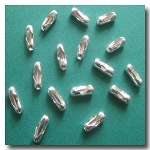 Use with Bead Tip Connector | Silver Plate 1-449.